It can be difficult to keep some privacy in modern life, that is why proxy anonymity is so important to me. The internet is full of people recording, registering and analysing - every visit to a web site is recorded in numerous locations. Your IP address and every move you make on the internet is logged and recorded at your ISP, and the vast majority of web sites record your address as well. It's kinda frightening, the simple fact that the very next web site you visit will be recorded against your IP address and account and kept for up to two years. In fact that whole list is available relatively easily from ISP to a wide variety of agencies depending on which country you're in. SO the prospect of obtaining some anonymity by proxy is quite appealing, and in fact it does help somewhat if you do it properly. A proxy server will sit in between your computer and all the web sites you visit, protecting your IP address. A true anonymous proxy will protect your identity being logged on web sites you visit. Unfortunately that is but a very small part of real anonymity on line. A proxy server for instance has it's own security risks, in fact if you use a free one it's quite likely your data will be recorded by the proxy owner (check out some of my posts on this blog for more information). Be very sure you are using a secure anonymous proxy where the logs are deleted instantly and the server is configured to protect your identity. An anonymous proxy will do little to protect your internet browsing privacy from the most complete record of your surfing - your ISP. 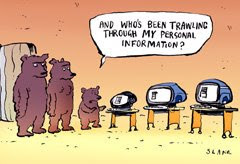 It's no coincidence this is where governments, agencies and such will go to pick up web records of people who they are watching. It's a complete record much more comprehensive than picking up individual web server logs. This is why ISPs are often run by the government in less liberal societies, saves them the bother of requesting the logs - they can just watch your traffic as you surf. So how do we stop this ? Well the main problem is that web browsing through HTTP is in clear text. Always has been, each request, every picture and video, every page of text - if it's passed by HTTP (Hyper Text Transport Protocol) it's instantly readable by anyone who has access. The only way to protect yourself properly is via encryption, if your web browsing is encrypted it is unreadable to anyone intercepting the data. Your ISP logs are just unreadable code if protected like this and yoru web surfing is private. Identity Cloaker provides the complete protection of your privacy, proxy anonymity is provided by a global network of fast proxies where your IP address is protected, in addition your browsing is encrypted so can't be read by anyone including your ISP, this is true anonymous surfing. If you're serious about protecting your privacy online from hackers, identity thieves, spyware and even our own government agencies, then you need to look at complete solutions like Identity Cloaker.